MyBlogSpark contacted me about a giveaway for Chex Party Mix, I couldn't refuse! They sent me some great recipes to choose from, but in the end I decided to search their site for the Chex Muddy Buddies recipe. I've heard this called "White Trash" and "Puppy Chow". I've always wanted to make this and never tried it before. In large microwaveable bowl, add butterscotch chips, chocolate chips, peanut butter and butter. Microwave on high for 1 minute. Remove and stir. Return to microwave and cook on high for 30 seconds. Remove and stir until creamy. The butterscotch chips didn't melt all the way, but it worked fine. Add vanilla extract and stir until combined. Measure 9 cups of Rice Chex mix into the melted mixture and stir until coated. In a large paper bag, pour the powdered sugar and then pour the Rice Chex coated mixture into the bag. Close the top and and toss and shake until well coated. Pour into a container and cool completely. We measured out about 2 cups per 5 take out containers. We loved it! So yummy! Now here's the best part! You can have your own Chex Party Mix. 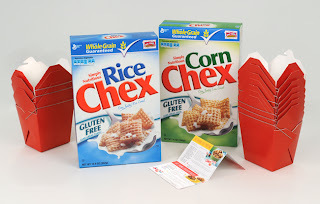 MyBlogSpark and Chex are going to send you 2 kinds of Chex cereal, 5 recipes cards to make various kinds of Chex Party Mix, 10 takeout containers and a $20 gift card to purchase the needed ingredients and decorating supplies. If you are into Cookie Swapping, why not change it up this year and do a Chex Party Mix Swap? How fun would that be to have a big group of friends bring their favorite kind of Chex Party Mix and swap with everyone? This giveaway will end Sunday December 18, 2011 at 6:00 p.m. EST. The winner will be chosen by Random.org and will be notified via email. 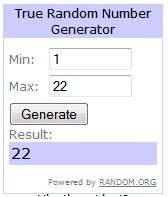 AND THE WINNER IS: #22 Brandy Stout. Brandy has been notified. To enter the giveaway, please leave a comment and tell me which Chex Party Mix recipe is your favorite. You can browse the recipes here. I will like to try the muddy buddies. Chex Caramel Chocolate Drizzles looks great to try. I would love to try the Chex PB&Chocolate Blast. YUMMY! The Chex PB & Chocolate Blast not only would by delish but is so colorful!!! I like the spicy chex mix! I love the puppy chow! It's like the kind you made. I can't be trusted around it though! So nummy! Love the "Muddy Buddy" recipe! Pumpkin Pie Crunch! Thanks for the chance to win! just found your space..love your space..
excellent posts with inviting cliks.. I like the original chex mix. I like to put more chex cereal and nuts then pretzels. I also put more sauce on it. Yummy.